Every holiday is a chance to get crafty. This week many of us will throw open our homes and welcome friends and family. This got us to thinking about the good 'ol centerpiece. A centerpiece can't be too tall or you can't see Aunt Sue and it can't be too big or there is no room for the food! 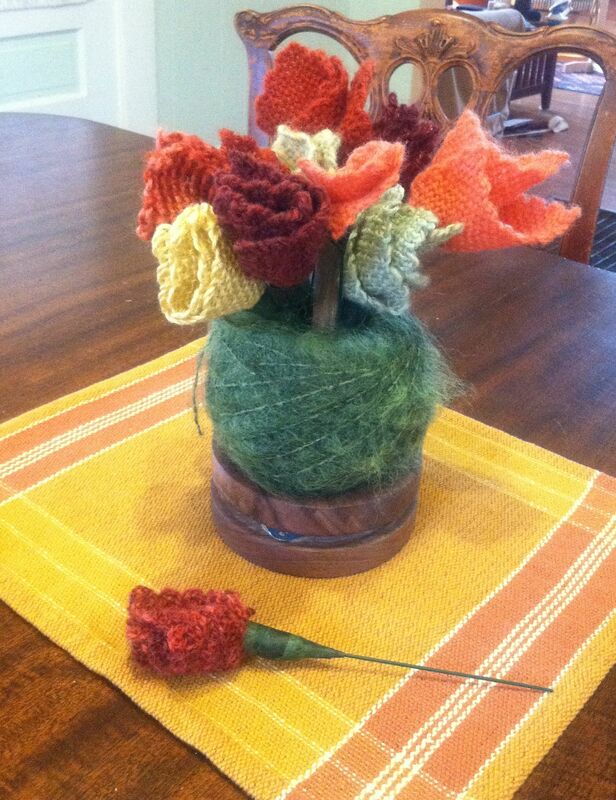 A handwoven mat, yarn buddie, ball of yarn, and peg loom roses make a just right statement for your table. Here is our answer to the perfect holiday table adornment. It started with the Yarn Buddie and a ball of yarn. Looking at it made us think that if we could decorate it somehow then we would have the perfectly-sized piece for the table. Ah, ha--pegloom woven roses! These are quite simple to make and are a great way to use up little bits of yarn. Make a 4-inch square for a rose, or a 2-inch square for a rosebud. Fold the square in half and then in half again and fold around a wire stem. Use floral tape to adhere the rose to the stem. Quick, easy, effective. Now that's crafty.